Central Laboratory of Electricity Transmission Company. I .The Government of Egypt has been allocated grant funds (the “Grant”) from the GEF which are administrated by the International Bank for Reconstruction and Development (IBRI)) and executed by the Egyptian Environmental Affairs Agency (EEAA) toward the cost of the Sustainable Persistent Organic Pollutants (POPs) Management Project (SPMP), and intends to apply part of the proceeds toward payments under the contract Supply and installation of GC /iMS System for the Ministry of Electricity and Renewable Energy – Central Laboratory of Electricity Transmission Company. 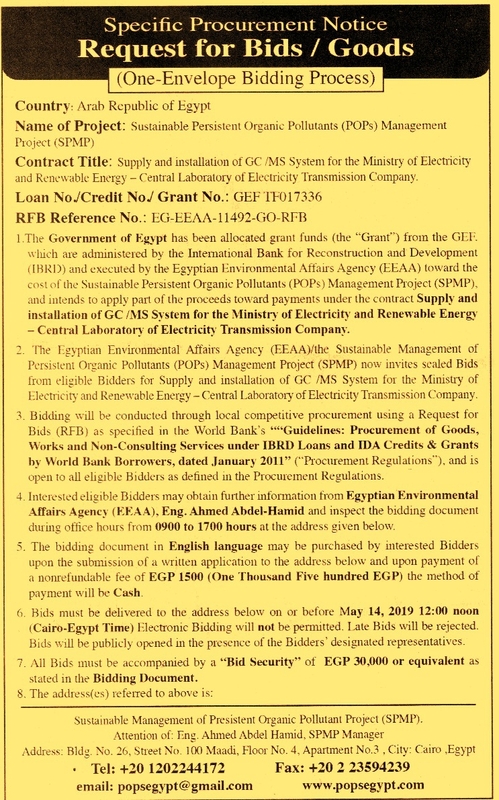 2 The Egyptian Environmental Affairs Agency (EEAA)/the Sustainable Management of Persistent Organic Pollutants (POPs) Management Project (SPMP) now invites sealed Bids from eligible Bidders for Supply and installation of GC /MS System for the Ministry of Electricity and Renewable Energy – Central Laboratory of Electricity Transmission Company. Bidding will be conducted through local competitive procurement using a Request for Bids (RFB) as specified in the World Bank’s “‘Guidelines: Procurement of Goods, Works and Non-Consulting Services under IBRD Loans and IDA Credits & Grants by World Bank Borrowers, dated January 2011” (“Procurement Regulations”), and is open to all eligible Bidders as defined m the Procurement Regulations. Interested eligible Bidders may obtain further information from Egyptian Environmental Affairs Agency (EEAA), Eng. Ahmed Abdel-Hamid and inspect the bidding document during office hours from 0900 to 1700 hours at the address given below. 7 All Bids must be accompanied by a “Bid Security” of EGP 30,000 or equivalent as stated in the Bidding Document.